Other: white cardstock, ink (gray, pink, yellow, green, aqua, blue). 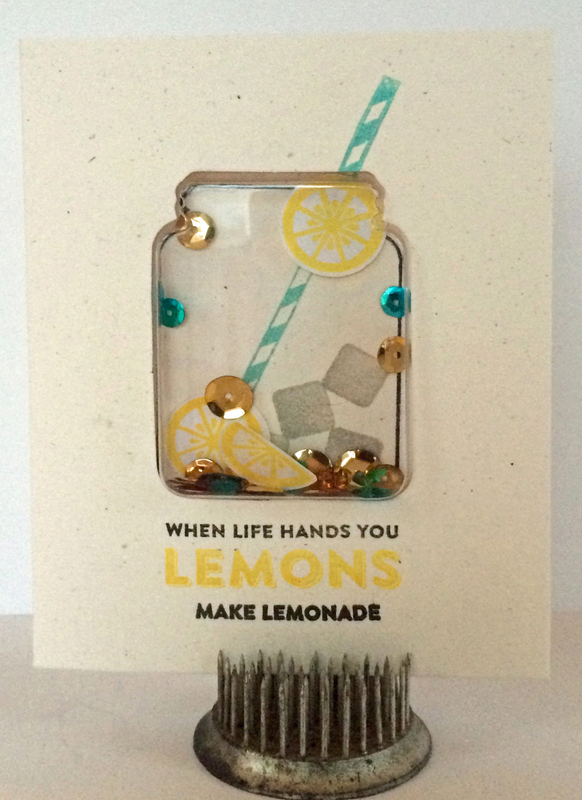 I wanted to share with you some cards created with the New Shape Shakers from Jillibean Soup and Hampton Art. Making Shaker cards have never been easier!!! Here's an image of the full collection. Cards with a die-cut opening to perfectly fit the shaker cup. 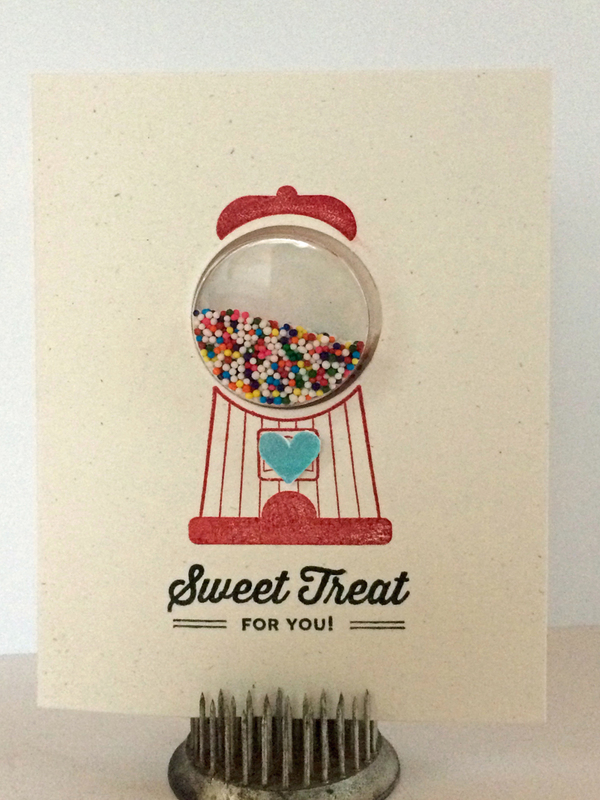 Stamps and dies that work together or alone to create shakers for all occasions. Other: white Bazzill cardstock, Tim Holtz Tiny Attacher, VersaMagic Ink, Silhouette Cutting System. Ribbon -- Michael's Stores, Inc.
Other: kraft cardstock, thread, white mist. Tags & Ribbon -- Michael's Stores, Inc. Wooden Tag -- Michael's Stores, Inc. 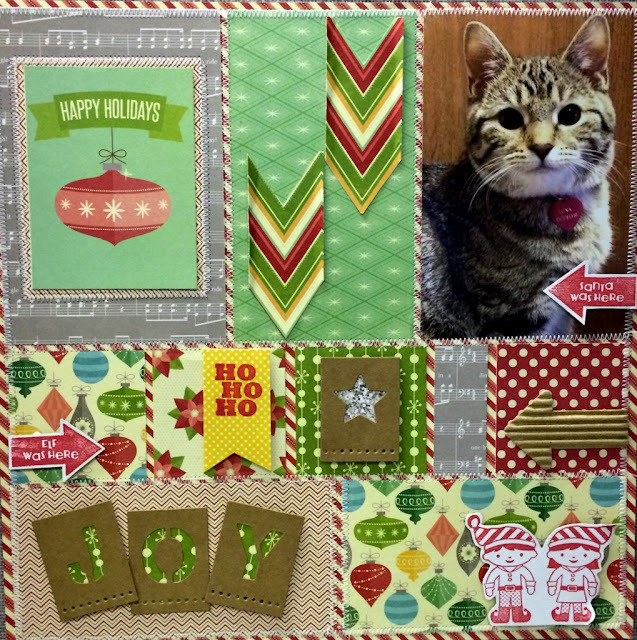 This is just a fun holiday pet layout created from some Jillibean Soup Holly Berry Borscht papers and the HamptonArt/Jillibean Soup Christmas Cheer Chowder clear stamp set. 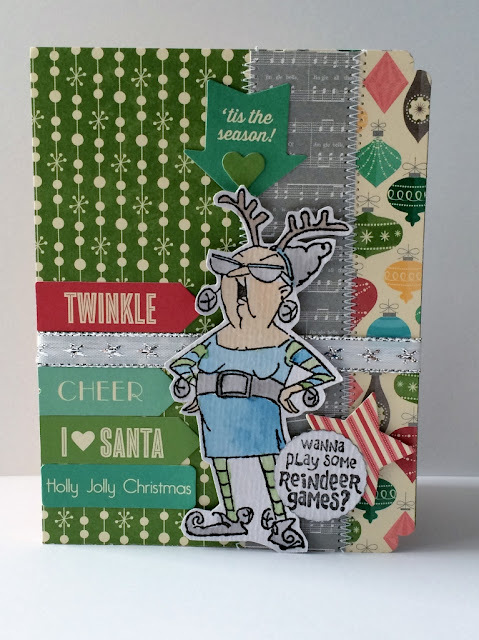 This began with a Creative Scrappers sketch #265 by the ever talented Kristine Davidson. I loved the grid style pattern and thought it would work well with what I had in mind. I began with a photo of my daughter’s cat Luna, so cute right. Next I pulled out Jillibean’s last two Christmas releases: Holly Berry Borscht with just a little Christmas Cheer Chowder added in. I laid out the papers until I found the combinations I wanted and then I used the peppermint stripe paper as a base and added all of my grid pieces with a little adhesive to keep them in place until I stitched them on with my sewing machine and white thread. I fussy cut out the arrows from a chevron paper and attached as shown. Next I pulled out the Christmas Cheer chowder stamp set and stamped out four images onto white cardstock in red pigment ink, all except the Ho Ho Ho stamped onto yellow salt paper. I set those aside to dry. Then I grabbed some brand new Jillibean Tile alphas to make the Joy title and the star in the center row. I added backers to each to make them stand out more on the patterns they were placed. 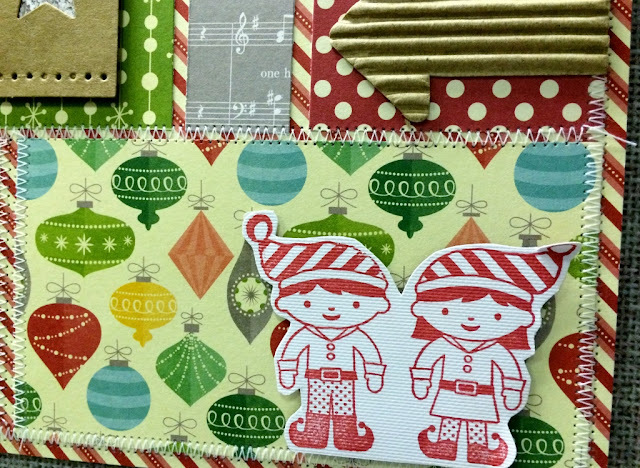 Then I added the stamped items back onto the page as shown, two arrows, Ho Ho Ho banner and pair of cute elves. Now I just have to decide if I put this in my daughter’s scrapbook album or my own? Hmmm decisions, decisions. The tree stamp in this set reminds me of the Peanuts Christmas Tree, so I love it. I used the new clear stamp set from Hampton Art and Art Impressions paired up with some brand new Jillibean Soup Alphabet Soup II papers. I chose four coordinating papers from the Alphabet Soup collection first for the card base layers. Two border strips on top and bottom in yellow stars and typography and two border strips on the sides in turquoise. Then I stamped the tree and sentiment image in black ink onto watercolor paper and set aside to dry. 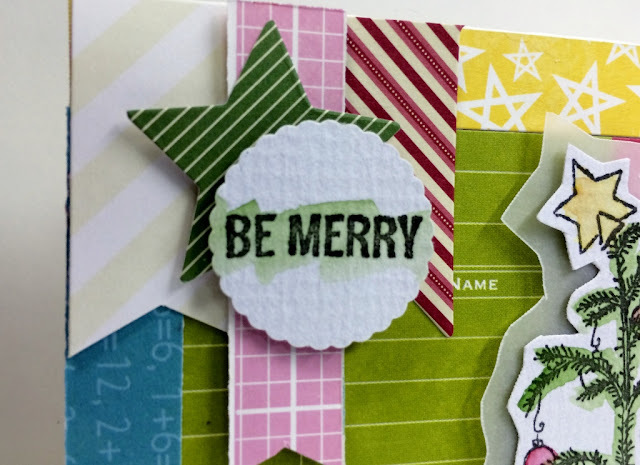 Then I chose 2 more papers to make the banners and added a sticker from the Holly Berry Borscht collection. Then I watercolor painted the tree and sentiment as shown and let dry. Once dry I fussy cut the tree and added a vellum border mat and attached to the card base with 3D foam dots. 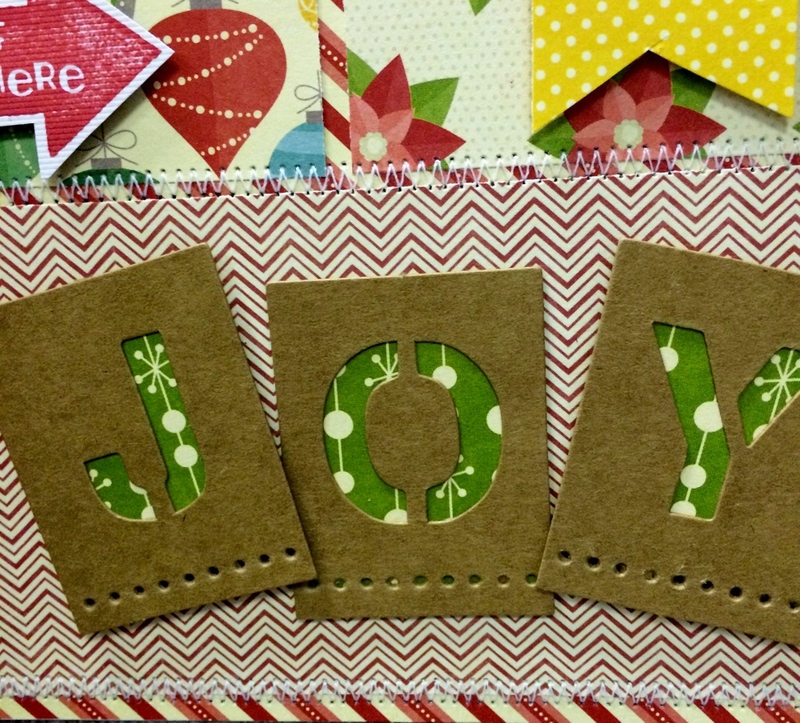 Then I punched the Be Merry sentiment out with a scalloped circle punch and attached it with 3D foam dots also. Pretty simple card, now I just want to find a blanket and wrap it around the base of the tree. Need a sassy Granny card this holiday season, who doesn’t right? This new stamp set from Hampton Arts and Art Impressions is always good for a laugh. I made all three of my cards this month from this same set, so it is also very versatile. To make the card base I picked three coordinating papers from the Jillibean Soup Holly Berry Borscht collection and adhered them as shown to the card base. Then I stitched the middle border strip on both sides. Next I used a decorative corner rounder on the outer edges. Then I stamped Granny and the sentiment in black ink onto the watercolor paper and let it dry. I added the silver star ribbon across the card base and then grabbed the coordinating sticker sheet from the same collection and added several sentiments as shown. Then I painted the Granny image and let dry. Next I punched out the sentiment with a scalloped circle punch then I fussy cut out Granny and adhere to card with 3D foam dots. Next I added the sentiment with a star sticker and 3D foam dots as pictured. One sassy Granny complete, and yes it is as fun as it looks. 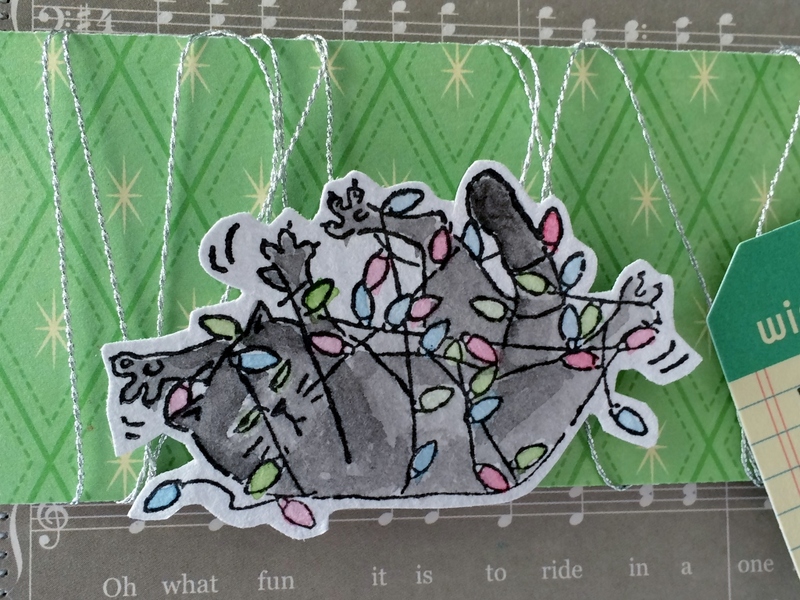 Nothing says it’s the magical Christmas season like a cat tangled in Christmas lights! This super fun clear stamp set is from Hampton partnered with Art Impressions. I started by grabbing some Jillibean Soup Holly Berry Borscht papers, I chose some non-traditional colors: mint green, grey and black. First I stamped the cat image in black ink onto watercolor paper and let dry. Then I added the grey Jingle Bells paper as a mat onto the black card base and then using my sewing machine I stitched the border to add texture. 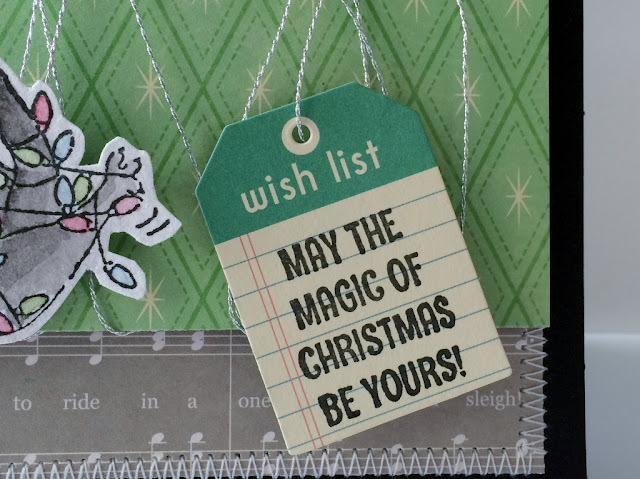 Next I stamped the sentiment in black ink onto the “wish list” sticker from the same collection. I thought it would be fun to watercolor paint the image, I love how it turned out. I let the image dry and then fussy cut it out. Taking cues from the image I made a wide border strip and wrapped it in silver twine, adding the sticker tag with 3D pop up dots. I added the border strip to the card base with 3D foam dots as shown. Then I added the image with 3D foam dots as well. Last I added the “naughty” sticker at the top left as shown. I hereby dedicate this card to my daughter’s cat Luna, she is always getting into mischief somehow. 1. Fold a 4.25 x 11 – inch piece of kraft cardstock in half to create a 4.25 x 5.5 – inch card base. 2. Cut a 4 x 4 – inch piece of red cardstock. Using the border punch create a dashed border on the lower edge of the red cardstock panel. Wrap a piece of twine around the red cardstock and tie into a bow. Adhere to the front of the card. 3. Stamp the snow globe image on a piece of white cardstock. Color the image with markers. Trim around the image and adhere to the front of the card. 4. Embellish the card with self-adhesive pearls. Today's card features some Christmas stamps and a die from the Hampton Art clear sets Tree Trimmings and Snowflakes. 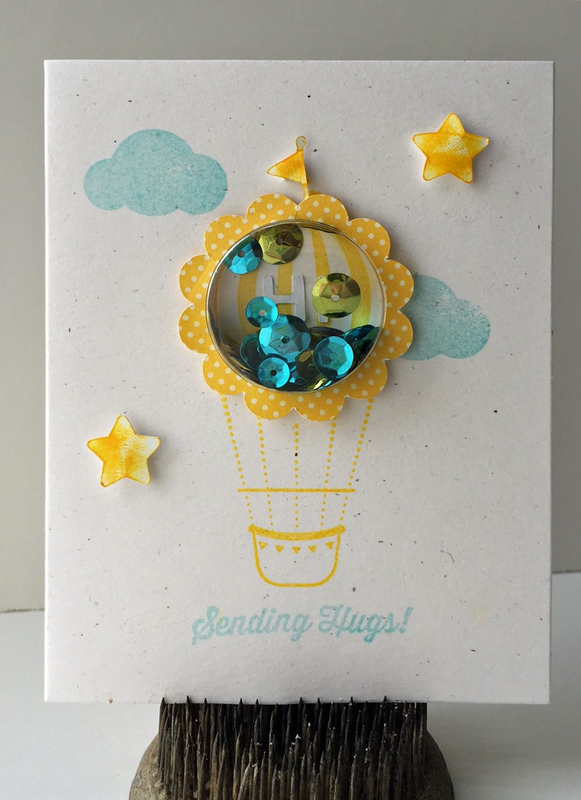 Make card base for a 4.25” x 5.5” aqua card. Cut a 4⅛" x 5⅛" kraft panel, die cut circles, and adhere to card. Color watercolor paper with Distress Inks and die cut two snowflakes. 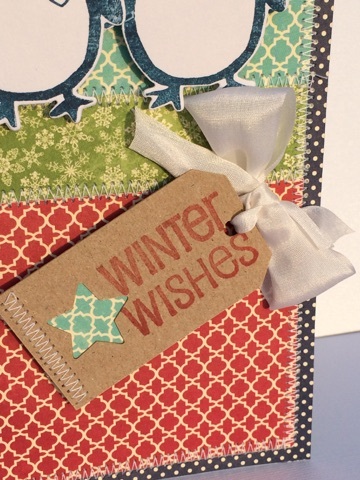 Stamp snowflakes with Versamark ink on die-cut snowflakes, apply glitter EP and heat emboss. 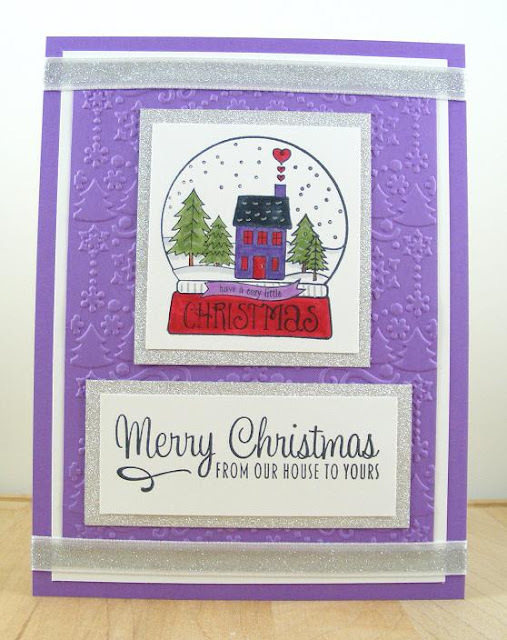 Stamp sentiment with Versamark ink on kraft panel, apply platinum EP, and heat set. Adhere pearls to snowflakes and snowflakes to card. Thanks for stopping and have a blessed day! 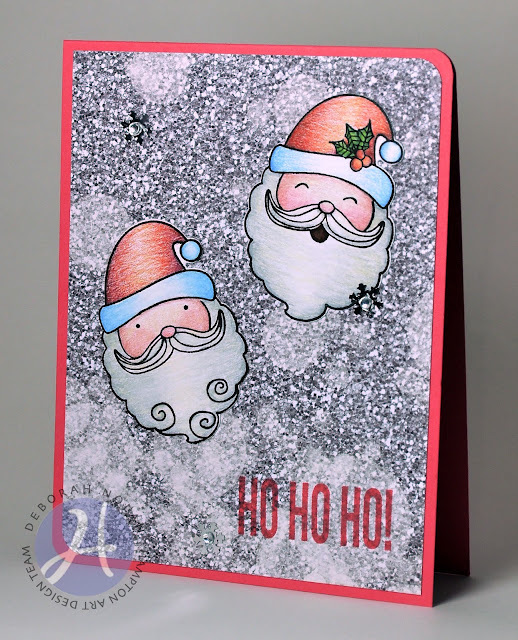 Today's card features some Christmas stamps and a die from the Hampton Art clear set SC0704 and a sentiment from the Art Impressions Reindeer Games clear stamp set. 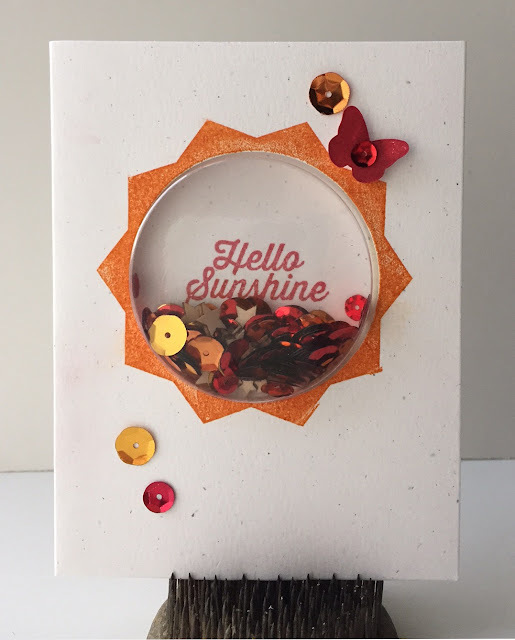 Make card base for a 4.25” x 5.5” melon card and round opposite corners. 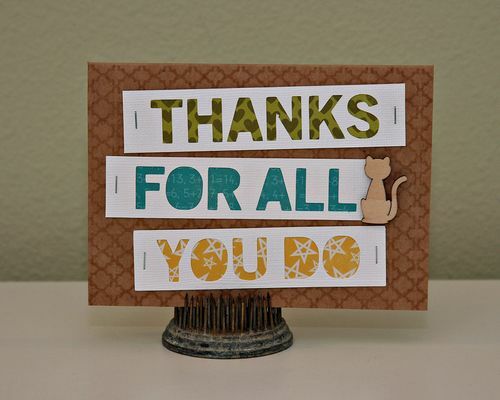 Cut a 4" x 5.25" patterned paper panel, round opposite corners and adhere to card. 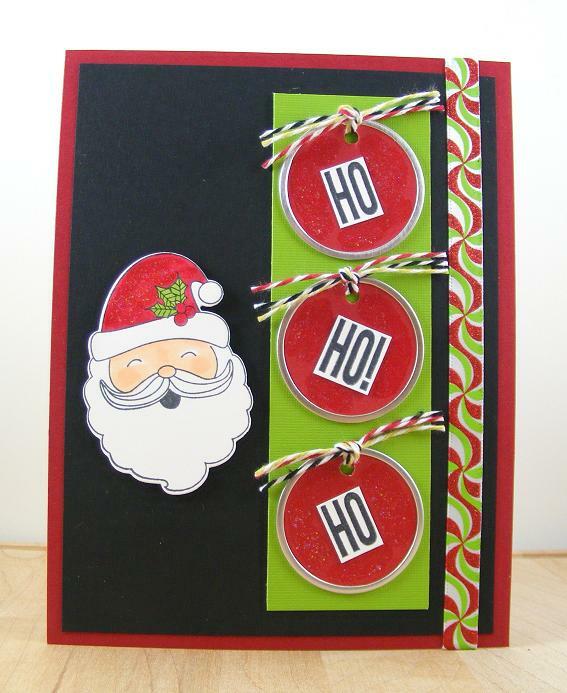 Stamp Santas, color with pencils, die cut, and adhere. Adhere silver snowflakes and gems. 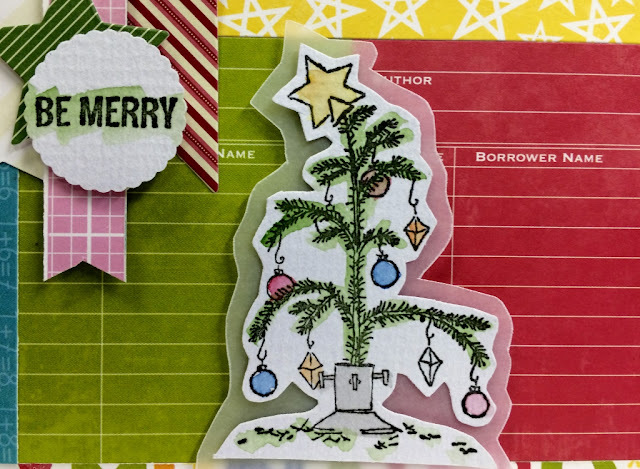 Today's card features some Christmas stamps from the Hampton Art Tree Trimmings clear set. Make card base for a 3.25” x 5” dark green card. 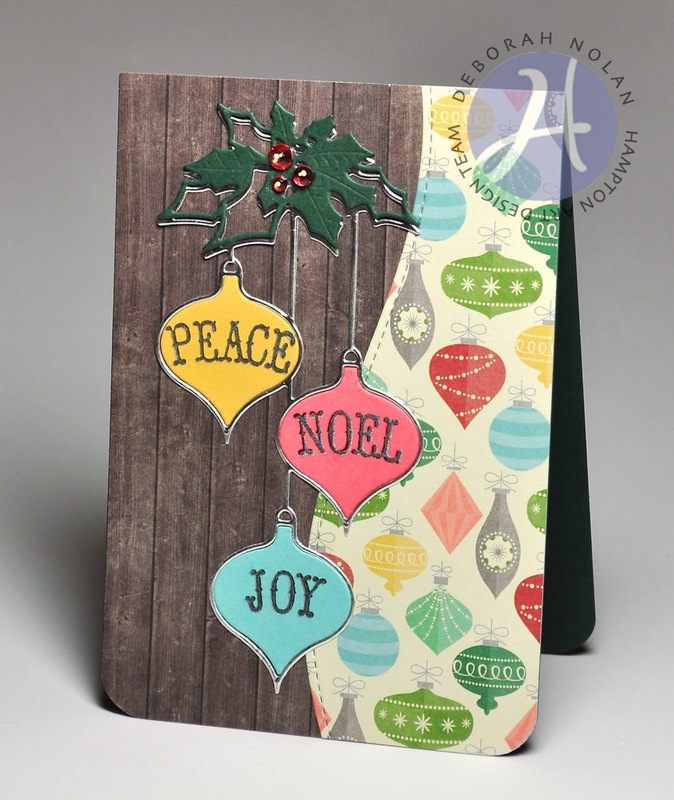 Stamp ornaments and sentiment with watermark ink on kraft panel. Apply EP and heat set. Ink chains for ornaments by dotting paper with gold gel pen. 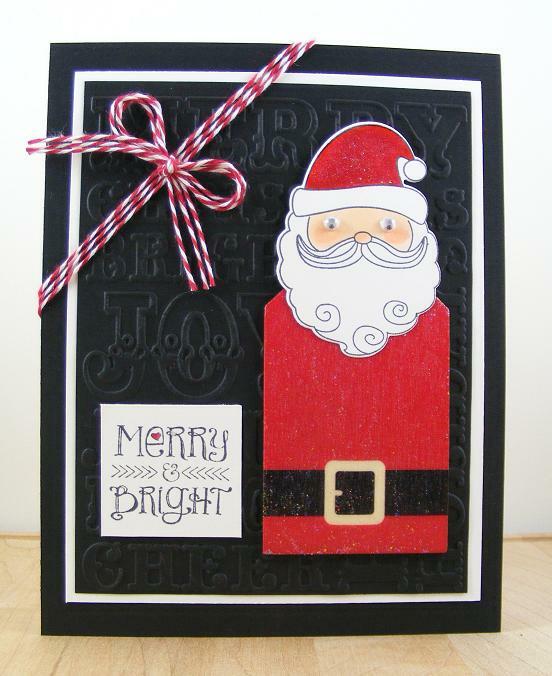 Adhere kraft panel to card. Wrap ribbon around card front and tie into bow. Hello, Card Lovers, and welcome back! Today's card features some fun stamps from Art Impressions that are licensed through Hampton Art. Make card base for a 4.25” x 5.5” white card and round bottom corners. Stamp Festive Snowmen snowflakes with yellow ink on card front. Stamp Reindeer Games image on watercolor paper and paint. Die cut painted image and adhere to card. Tie ribbon into bow and adhere. 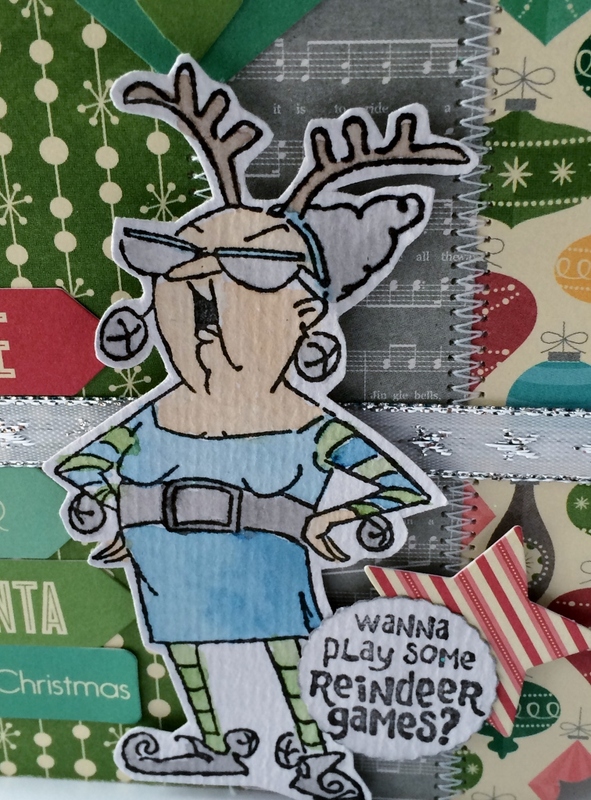 Stamp Reindeer Games sentiment with red ink on white cardstock, trim, and adhere. 1. Fold a 4.25 x 11 – inch piece of green cardstock in half to create a 4.25 x 5.5 – inch card base. 2. Cut a 4 x 5.25 – inch piece of white cardstock. 3. In the lower corner, place the poinsettia stencil. Using small ink pads or foam applicators apply color to the flower design, yellow in the center, red for the flower petals and green for the leaves. Remove the stencil. 4. Stamp the sentiment with black ink. 5. Adhere the white panel to the front of the card. 6. Cut a 4 x 2 – inch piece of red cardstock. With a border punch, create a decorative edge along the bottom edge. With a white pen, add faux stitching above the decorative edge. Adhere the red cardstock to the front of the card. 7. Wrap a piece of ribbon around the card and tie into a bow or knot. Christmas is officially just around the corner, time to create some handmade Christmas cards! 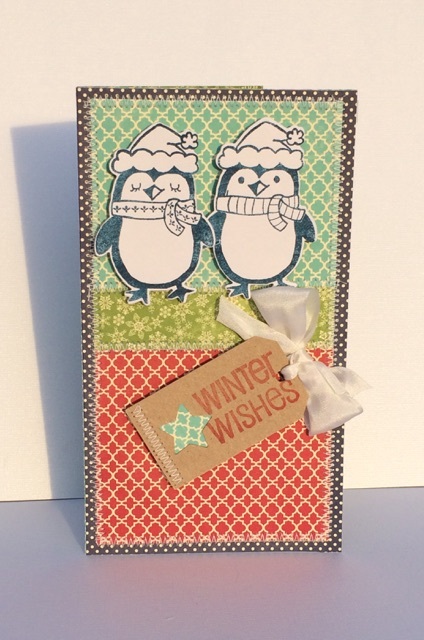 Add a couple cute penguins and you just can’t go wrong, these are from a Hampton Art stamp & die set. Using some classic Jillibean Soup papers I started with the Navy salt as a base. Next I layered on some Winter Tortellini papers in turquoise, green and red. Then I outline stitched them all to the card base. Next I stamped the penguin couple in navy ink onto white cardstock. Then I grabbed a kraft tag and stamped on the sentiment in red ink as shown. Last I added a beautiful white silk bow and attached the tag to the card base at an angle. 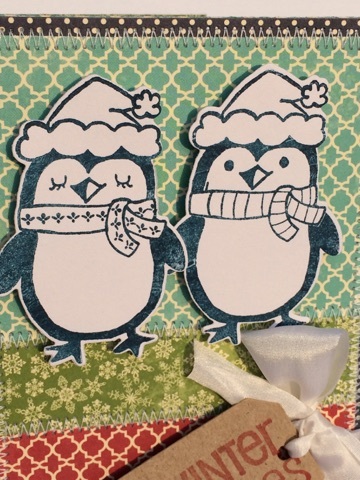 It is just that easy to get started on your Christmas cards and these cute penguins are great incentive I think. May your Christmas season start out merry and bright. Welcome back, card lovers! I've got another Christmas card for you today - this time paying homage to ornaments. Make green card base for a 3.25” x 5” card. Cut wood strips PP panel to fit front and adhere. Die-cut ornaments PP and adhere. Die cut entire Clairemont Ornaments from silver foil paper, one ornament apiece from teal, marigold, and berry, and one holly topper from green. Stamp ornaments with sentiments in silver first, heat set, and then stamp again in black. 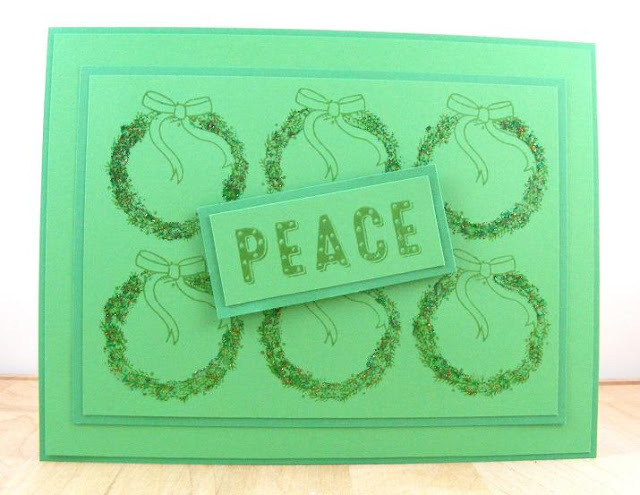 Adhere die cuts in this order: silver ornament outline, green topper, ornaments. Adhere gems and round bottom corners. Welcome back for another Christmas card featuring Hampton Art goodies! Make card base for a 3.25” x 5” card. 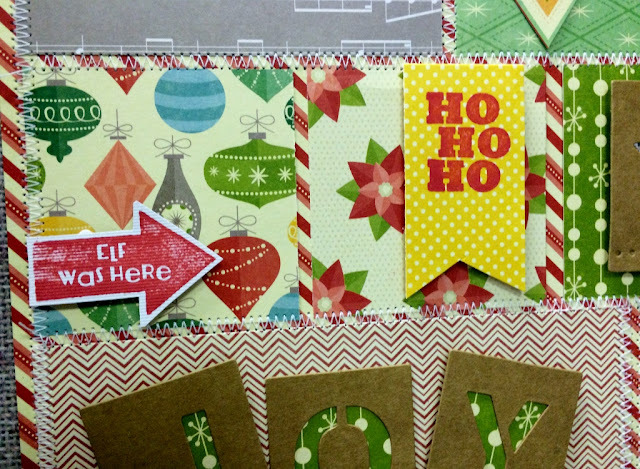 Cut PP on angle to fit card front, die cut a zigzag border along top edge, and adhere. Die-cut two sprigs from brown card stock,holly and berries from green and red card stocks, and bells from silver foil paper. Stamp tag on white card stock and trim. 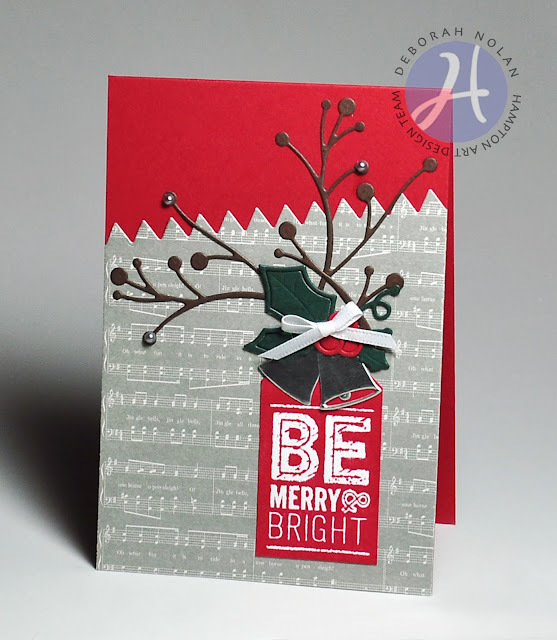 Adhere to card front in this order: sprigs, tag, bells, and holly leaves and berries. Good morning, Stamp Lovers, and welcome back! Today's card is simple but has a certain snazzy zap with the help of some Copper Stickles! Make card base for a 3.25” x 5” card and round bottom corners. Cut strip of snowflake PP and adhere to card front. Cut strip of grey music paper and adhere to card front. 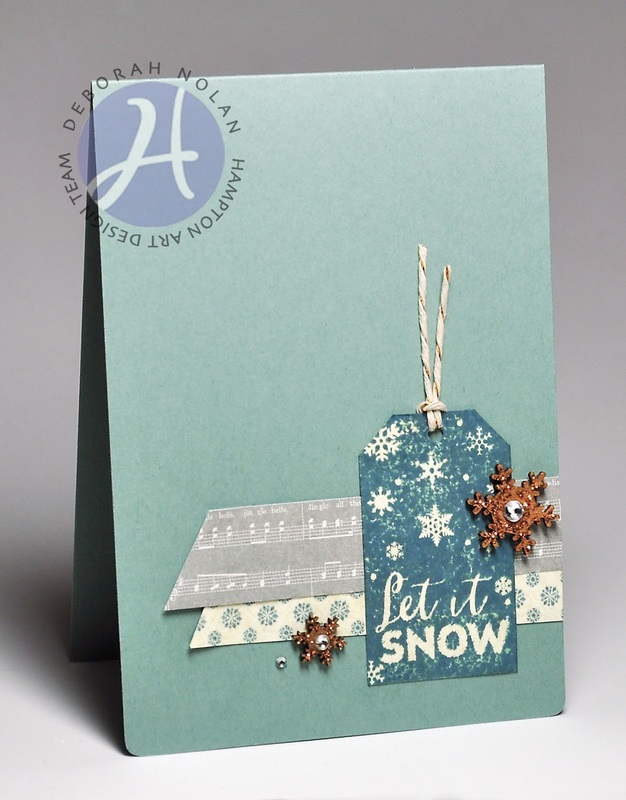 Stamp Let It Snow Tag on cream card stock in Aqua Mist ink, then in Enchanted Evening. Trim stamped image from paper, punch hole in top center, thread with hemp, and adhere to card. Color tops of snowflakes with copper marker and apply copper Stickles. 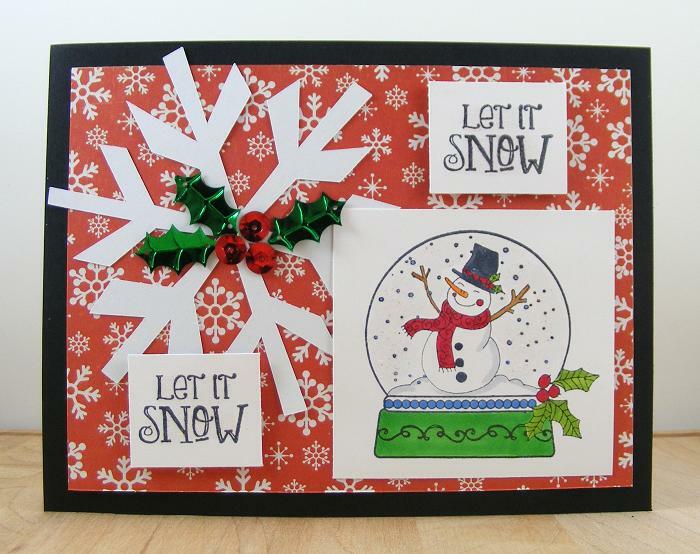 Once Stickles are dry, adhere snowflakes and gems to card. 1. Fold a 4.25 x 11 – inch piece of red cardstock in half to create a 4.25 x 5.5 – inch card base. 2. Cut a 4.25 x 4 – inch piece of yellow cardstock. Using a border punch, create decorative border on one long edge. Adhere to the front of the card. 3. Cut a 4.25 x 3.5 – inch piece of white cardstock. Stamp the image of the penguins in the center with black ink. Stamp the sentiment below the penguins with black ink. 4. Color the penguins with markers. Adhere the panel to the front of the card. 5. Wrap the ribbon around the front of the card and tie into a bow. Embellish the card with self-adhesive pearls. Hello everyone! 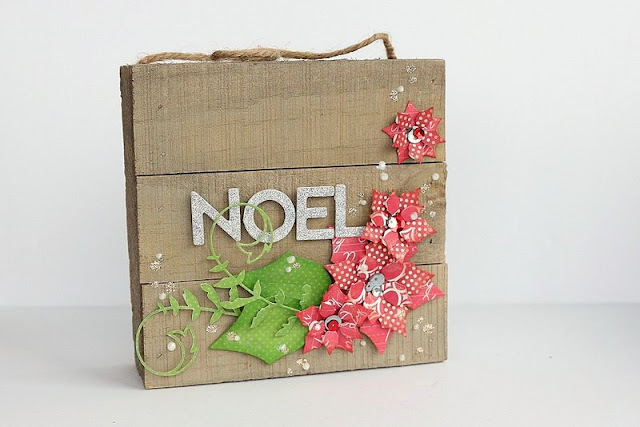 This month, I've been playing around with a seasonal, off the page, project. My aim was to create a wall hanging using Mix the Media Wood Plank and a few branches found while out and about in our local neighborhood. Jillibean Soup patterned papers are so beautiful to work with that I can easily combine several collections together and still have my project looking cohesive. Those of you in the Northern Hemisphere are entering a time of beautiful orange and yellow coloring. But, here is the Southern Hemisphere, we are also enjoying the seasonal change! My color choices in paper reflect a universal outlook between the two seasons. While I have predominantly included yellow and orange hues, the touch of blue freshens the project, injecting Spring into my home decor. Firstly, we need to gather the supplies, including a few twiggy branches and the Jillibean Soup Mix the Media 12 x 12 Wood Plank. Layer the branches diagonally across the Wood Plank surface. Once you are happy with the positioning, use a hot glue gun (very carefully!!) to secure the branches in place. The branches I had used already had fallen to the ground and were quite aged and dry. Next, I punched several 1-inch and 2-inch circles from the Jillibean Soup patterned paper collection. I even punched circles from the Stampable Mini Woodgrain bags! Once you have enough varied patterned paper circles, using a hole punch, I placed a single hole near the top of each circle. The small hole allows you to loop a thread through the hole to then secure it to your tree branch. I have also used different colored Jillibean Soup Baker's Twine to add that extra bit of texture to the wall hanging. To complete the project, randomly loop the circles to the secured branches. Add as many or as few circles you desire to the home decor. As an added bonus, you can ask your family and friends to add notes to your tree, detailing what they are thankful for over the season.